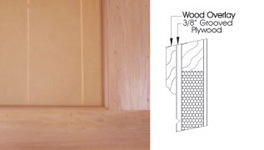 Door frames are constructed using 1-1/8" thick finger-jointed West Coast kiln dried Hem/Fir heavy stile and rails, Tongue & Groove weather joint at meeting rails and a 1-1/8" Polystyrene core. 1/4" Luan Mahogany Plywood is pressure laminated to both sides of frame (E Series) or 3/8" MDO Plywood on exterior (M Series). 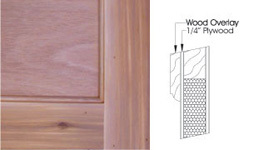 A 3/4" thick wood overlay is applied to the door face to create the design, the (C & H Series) have an addition layer of T&G material applied to the door face prior to the application of the overlay design. The overlay material is back cut with 1/8" grooves to help resist cupping or warping before it is applied to the door. All windows are true divided, if overlay is an arched pattern, the top of the windows are also arched. 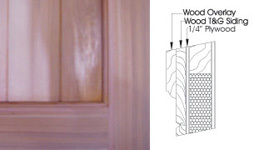 Door faces are Paint Grade unless otherwise specified Stain Grade. Frame thickness: 1-1/8", Face material thickness: 1/4", Overlay thickness: 3/4"
Overall door thickness: E Series 2-3/8", M Series 2-1/2", C Series 3-1/4"
1/8" clear annealed glass standard, clear obscure and insulated glass optional.